During repayment, you'll want to stay up-to-date about the student loan industry. Here are some resources that may be helpful to you. In partnership with Ready Set Repay, Oklahoma Money Matters (OKMM) publishes a monthly newsletter called Your Bottom Line, featuring news and resources for students, consumers, campus professionals, counselors and community partners. Check out the latest edition for timely information about personal finance, college planning and student loan management. Ready Set Repay, the default prevention initiative of the Oklahoma College Assistance Program (OCAP), strives to help student loan borrowers make smart borrowing decisions and successfully repay their student loans. There are several different student loan repayment options for borrowers to consider, so we created Student Loan Repayment Plan Options, a short video that explains the eight different repayment options available. The video is available on OCAP’s YouTube Channel and on the Videos page at ReadySetRepay.org. Feel free to share this video or link to it from your website. Ready Set Repay, the default prevention initiative of the Oklahoma College Assistance Program (OCAP), is pleased to share our latest tool for financial aid partners: our new Interest Capitalization poster! As part of OCAP’s continuing mission to help you teach students across the state how to make smart borrowing decisions and successfully repay their student loans, we are constantly developing new educational materials. Our latest poster focuses on the long-term benefits to students of making interest payments toward student loans while still in college. Click here to view or print the poster. For more financial aid and default prevention resources, visit the Partners section at ReadySetRepay.org. The unauthorized use of instutional logos, seals, names and other trademarks is a growing trend. Often, third party companies using such trademarks without authorization target student loan borrowers for payment for services that would otherwise be free. The Department of Education (ED) recently issued two cease and desist letters to third-party "debt-relief" companies that were using ED's official seal without authorization. Provide warnings to students, including on institutional websites, about so-called debt relief companies. Provide information to students indicating that they do not need to pay for loan benefits for Federal student loans. Review institutional websites to ensure that they provide the most up-to-date information about the terms and conditions of federal student loans and the servicing of those loans. In reviewing several institutions websites, ED became aware that some sites contain outdated information about the Direct Loan Servicing Center and had directed students to call a number that is no longer associated with ED. To learn more, read ED's electronic announcement, Third-Party Debt Relief Companies’ Use of Institutional Names, Logos and Other Trademarks. Are you a college student? Have you borrowed student loans? Do you know how much you owe? As you prepare for the upcoming semester, use the following resources to help you manage what you’ve already borrowed. National Student Loan Data System (NSLDS). This database can help you keep track of all federal financial aid monies you receive as a college student, including Pell Grants and federal student loans. Visit nslds. ed.gov to review how much you’ve borrowed and which loan servicer is managing your loan(s). Federal Student Aid Repayment Estimator. Visit the Managing Repayment section at StudentLoans. gov to explore this tool. Use the Repayment Estimator to calculate your monthly loan payment or to explore repayment options based on your income. Your loan servicer. Loan servicers handle the billing and services associated with your loan. Some offer 24/7 customer service, smartphone apps or websites with downloadable forms and helpful information to help you better manage your student loans. If you don’t know who your loan servicer is, find it using NSLDS. Learn more about money management at OklahomaMoneyMatters.org. In these challenging economic times, you may see loan forgiveness as a potential solution for your student loan debt woes. However, it’s important to understand that forgiveness of all or part of your student loan is rare and happens under very specific circumstances. Click here for a PDF with helpful information about loan forgiveness and repayment programs. Throughout your higher education journey, you’ll have many decisions to make concerning student loans. Whether you’re deciding if you need to borrow student loans, how much to borrow or which repayment plan to choose, it's important you're equipped with timely information every step of the way. As a borrower, understanding basic student loan terminology is invaluable. With that in mind, Ready Set Repay has created an electronic flyer defining 20 basic student loan terms used by the U.S. Department of Education. 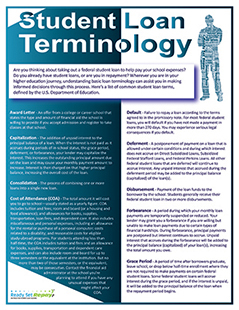 Download the Student Loan Terminology electronic flyer.